17th century map of Morocco on the Barbary Coast of Africa. 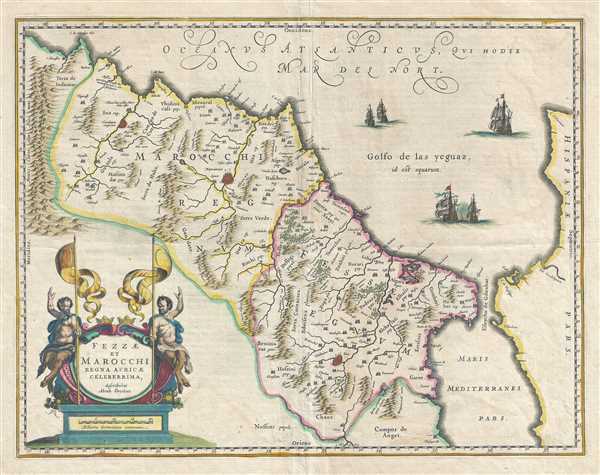 This is a beautiful 1675 map of Morocco on the Barbary Coast of northern Africa by Johannes Blaeu. Oriented with north on the right, the map covers Morocco and the Kingdom of Fez from the Atlas Mountains north to the coast of Spain. The Strait of Gibraltar is also included. The map renders the entire region in extraordinary detail offering both topographical and political information with mountains and forests beautifully rendered in profile. The fortified towns of Marrakesh (Marruecos), Fez and Taradande are also identified. The map is based on the 1570 map by Abraham Ortelius, who is credited here in the title. While most of the Barbary coast fell under the Ottoman rule during this period, portions of this region were under the influence of the Spanish from 1580 to 1640, with Tangiere briefly under British rule between 1662 and 1684. In spite of being a hotbed of piracy, this region managed to trade sugar, tobacco, gold and fine leather with France and England. A highly elaborate title cartouche adorns the lower left quadrant of the map. Beautifully illustrated ships are seen sailing in the North Atlantic Ocean. This map is based on the 1570 map by Ortelius and issued by Blaeu in 1675. Blaeu, G., Atlas Major, 1675. The Theatrum Orbis Terrarum, sive, Atlas Novus, also published as the Atlas Major was first issued by Willem Jansz Blaeu and his son Joan Blaeu in 1635. The first edition contained about 207 seminal maps that ushered in a new golden age of Dutch cartography and established the distinctive flourishing highly decorative baroque Blaeu style. Most of the maps in this edition were closely based upon the earlier well established work of Jodocus Hondius, whose' map plates he had earlier acquired. The atlas continued to be published and republished in expanded and revised editions, reflecting the most up to date cartographic conventions and data derived from Dutch navigators and merchants then plying their trade throughout the world. Willem Blaeu died in 1638 and his son, Joan (Johannes), called teh Altas Major took over subsequent publications of the atlas. The final edition of the atlas, published from 1662 to 1672, consisted some 594 maps compiled into upwards of 9 volumes with some editions containing as many as 12 volumes. In 1672 a tragic fire destroyed the sprawling Blaeu workshop, then the largest cartographic publishing house in the world. Countless map plates were lost and the following the fire the Blaeu firm ceased production. Very good. Minor wear and verso reinforcement along original centerfold and edges. Some foxing and creasing at places. Van der Krogt, P. C. J., Koeman's Atlantes Neerlandici, [8615:1B], 1.406.